Stippling is the process of giving walls and ceilings a raised texture of some kind. The design is an acquired taste—or sometimes a taste born of necessity. Given a choice, most homeowners today would choose a smooth, glass-like texture for their walls and ceilings. Besides being the preferred style of today, smooth surfaces help wall color stand out better. Because there are no bumps to create a shadow effect, the surface appears brighter. There are instances, though, where stippling is desired. Texture applied to walls and ceilings creates small shadows due to the bumps and depressions. While these shadows do not matter much in direct light, they lengthen as the light source moves at a sharper angle to the wall. This darkens the overall shade of the surface, thus darkening the room. The advantage of this darkening effect is that it hides surface imperfections better. If your drywall is not perfectly installed—if it has seams, bulges, sags, or depressions—stippling can go a long ways towards hiding joint imperfections. This is one reason why ceilings are so often texturized. Because ceilings receive the most light, it is very hard to hide their imperfections. Stippling is generally created by applying a coat of texture compound—a material that is thicker than ordinary paint but still thinner than the bulky additives used to make popcorn or cottage cheese ceilings. A texture compound for stippling can be made yourself by thinning out drywall compound (mud) with water in a 4:1 ratio. Use a five-gallon bucket and a paint mixer attachment on your drill to thoroughly mix the texture compound. You may need a drill that accepts a secondary handle, because the drill may be hard to hold without it. You can also purchase premixed texture compounds. Popular brands include Sheetrock Stipple Wall & Ceiling Paint and Behr Interior Texture Paint. Either way, once the texture is applied and fully dried, it can be painted in the same fashion as any wall or ceiling surface. Stippling effects can vary depending on how the material is applied and rolled, so it is a good idea to practice the technique on scraps of drywall or even sheets of cardboard before moving to your walls and ceilings. Practice with thin coats vs, heavy coats, and experiment with allowing the texture material different periods of drying time before you roll it. You will be surprised by the different effects you can achieve. Stippling is NOT an activity you can do without covering floors and furniture with drop cloths. By its very nature, texturing is a messy operation that results in wet texture material flying in all directions. When stippling a ceiling, even the most careful painter will need to cover the floors and adjoining wall surfaces, including door and window trim. Use drop-cloths for the floor and plastic sheeting for vertical surfaces, hanging it with painter's tape. 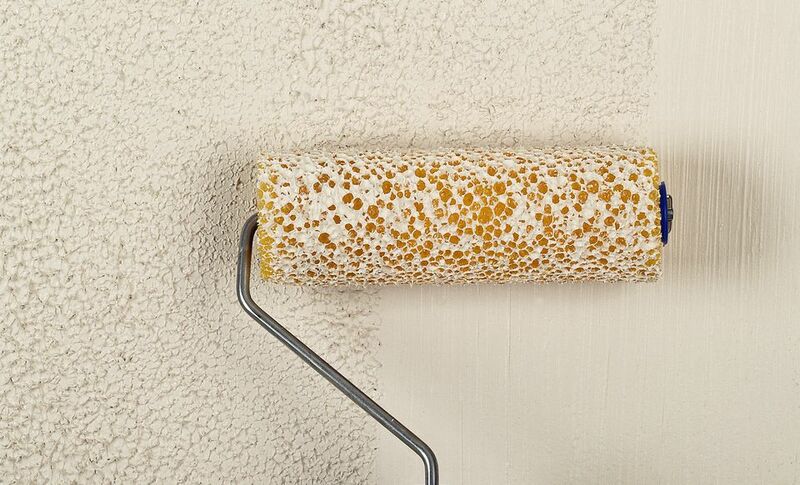 It may sound counter-intuitive since the reason you are stippling is to hide wall imperfections, but some patching of wall and ceiling surfaces may be necessary before you can apply the stippled texture. First, patch any holes or chips with either drywall compound or light-weight spackle. Use your drywall knife to force the compound into the hole and give it a quick swipe with the edge of the knife to smooth the compound across the surface. Do not spend too much time on this, as it will get covered with the texture material. It's usually not necessary to sand the surface smooth—simply smoothing it with a drywall knife is fine. Stippling involves a two-part rolling process—an initial application, then a second rolling over the applied material once it has partially dried. Getting the timing correct is the trickiest part of the process. Mix up and stir the texture paint or your homemade compound until it has the consistency of thick latex paint. It should be smooth and easy to roll on. Dip the roller in the paint tray, roll it out, and then apply over the wall or ceiling surface. Note: An ordinary roller cover will produce a stipple texture, but there are also special stipple roller covers available that are designed for stippling. Where roller cannot reach—the corners and edges around woodwork—complete the texturing by applying the material with the flat face of a paint brush. Let the texture paint dry partially—about halfway to full dryness. Test the surfaces by pressing your thumb into the surface and pulling it out. The result should be sharp spikes, almost like meringue. When the applied texture material has reached the desired consistency, roll over the surface again. This will slightly pull up the partially dried material, creating the three-dimensional texture you're seeking. In places where the roller cannot reach, you can use the flat face of a paintbrush to pull the material up slightly from the surface. As an option, before the surface is completely dry, you can “knock down” the surface by smoothing a drywall knife across the texture, with the tool held at a flat angle. This slightly flattens the peaks of the surface, creating a look much like textured plaster. Again, the texture paint needs to be the correct consistency for this to work. If too wet, the texture will smear; if too dry, it will not knock down.